This "have you seen" post is, more or less, a note to myself to put Katherine Marsh's The Night Tourist on my list of books to read. Of late, I'm finding/learning about several books that are set in New York City and have Native content--in the form of ghosts or Indians-of-the-past. 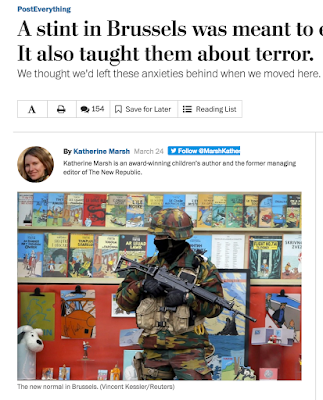 That soldier, with machine gun, standing in front of a book display is, of course, chilling. As my eyes moved to the books on the shelves, I realized the soldier is standing in front of a wall of Tintin books. The one on the top shelf, 3rd from the left, is Tintin in America. It is one of the much loved Tintin books have stereotypical, racist, derogatory content. As I started looking into Tintin articles to link to in this post, I found an article in Salon: Tintin's racist history: Symbol of Brussels solidarity is uncomfortably divisive. In it is a link to an article in Vox: How Tintin became the symbol of solidarity in the Brussels attacks. The Vox article is mostly a series of tweets of Tintin crying. I don't know if Marsh chose the photo that was used with her article. She doesn't mention the Tintin books. 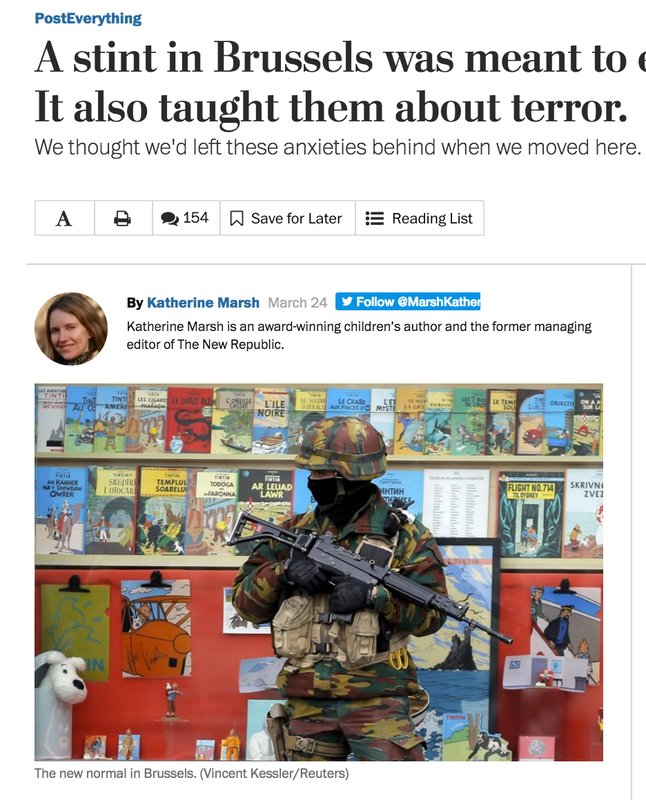 My guess is that someone in the editorial department at the Post has read the Vox article and thought it a good choice, given that Marsh writes children's books. The image did something else for me: it caught my eye and led me to look at Marsh's first book, which (as noted above) has Native content of the no-longer-around kind, but it also captures the importance of children's books. Far too many people look down on children and the books created for them, but they're important. They shape the ways we view the world. How they do that is something that needs more attention. When I read Marsh's book, what will I find? Does that book add to the misinformation that Native peoples no longer exist? If/when I read her book, I'll be back. If you've read it, let me know what you noticed when you read it.